The members of Ms. Marston’s kindergarten class are cleaning and decorating their room for the upcoming Open School Night. Molly and Tommy work on drawing pictures to put on the walls. Molly draws her family: Mommy, Mama Lu, and her puppy, Sam. But when Tommy looks at her picture, he tells her it’s not of a family and Molly doesn’t know what to think. 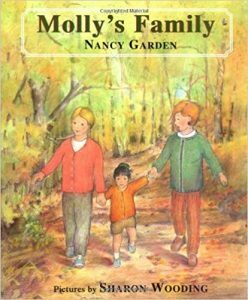 One of the greatest parts of this book is that not only does Molly’s two mothers explain to her that families are based on love and commitment, but even her teacher takes time to explain to her students that each family can be different. The other children respond well to this and begin to describe their own families, each comparing the differences openly and proudly. The presentation of this book is commendable – the art is playful and colorful, very appealing to the target audience but also enjoyable for the mature reader.